We have select BERNINA sewing machines available online to be shipped directly to you! 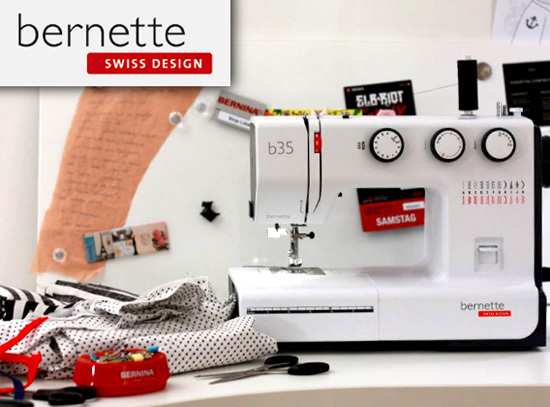 Or if you want a great sewing machine at an affordable price — choose a bernette! Do you have loads of ideas – but not a sewing machine that can keep up with your creativity? Our bernette models are just what you’re looking for! Embellish, embroider, simply shorten a pair of trousers and much more — whatever you want to do, a bernette can handle it with impressive reliability. This is no surprise, because the quality of these smart machines is monitored constantly by BERNINA. Allow yourself be inspired and discover how easily you can turn your imagination into unique clothes, accessories, home decorations, etc. You can now do this more easily than ever before, thanks to the many convenient features. Whether inexpensive mechanical sewing machine for beginners to computerized models with hundreds of stitches and big-ticket features, bernettes deliver. Sew like a pro with a big fun factor at an attractive price with your bernette!